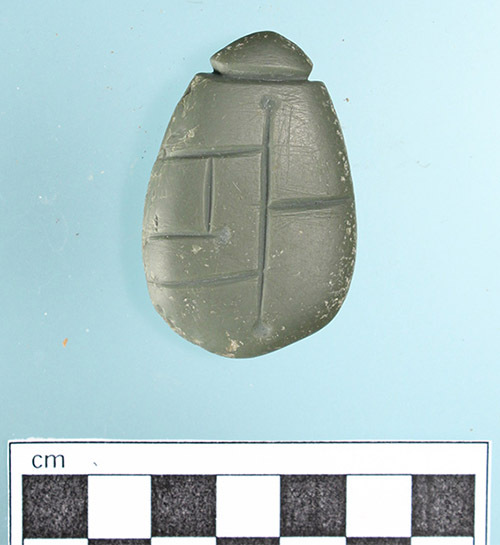 This carved stone pendant was found at the Powell Canal site (3CH14) in Chicot County, Arkansas along with other cultural features associated with the Baytown and Coles Creek periods (AD 400–1100). In October 1980, a road grader removed the plowzone from part of the Powell Canal site 3CH14 on Bayou Macon near Eudora in Chicot County. The purpose of this work was to evaluate the archeological significance of an area of the site to be impacted by realignment of approaches for a replacement bridge to be constructed over the Bayou by Arkansas Highway and Transportation Department (AHTD). Examining the spoil from the grading, AHTD Highway Archeologist Burney McClurkan found an engraved stone pendant which he subsequently gave to the Arkansas Archeological Survey research station located on the University of Arkansas at Monticello campus. The 1980 grader work exposed a plethora of refuse-filled pits and other cultural features associated with the Baytown and Coles Creek periods (AD 400–1100) in the Lower Mississippi Valley sequence. Extensive excavation followed in May 1981. Results from both years were reported by House in 1982. The pendant (Cat. No. 80-1119-4) is made of a very fine-grained material identified by the staff of the then Arkansas Geological Commission (now called Arkansas Geological Survey) as novaculite from the Ouachita Mountains. The material is predominantly green but a diffuse area on the reverse is dark red. The pendant is oval in outline, 48mm in length, 32mm in width and 11mm in thickness. The sides of the pendant exhibit fine peck marks (partially smoothed over) from initial shaping. Both faces are very smooth; the front exhibits polish that obliterates any scratch marks or striations resulting from final shaping of the object; the back, unpolished, is covered with fine striations. 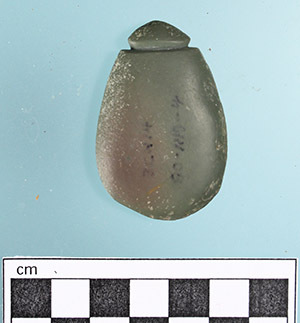 The pointed end of the piece is deeply grooved around its circumference, presumably for adding a cord to suspend the piece. Reverse. The pendant is made of novaculite from the Ouachita Mountains. It is oval in outline, 48mm in length, 32mm in width and 11mm in thickness. Close examination of the front of the pendant reveals fine striations paralleling the engraved lines and, in some instances, extending past the end of the line. The striations are on top of the polished surface and were presumably made when the straight lines were being engraved into the surface. The front of the pendant exhibits a complex design consisting of deeply engraved, perpendicularly intersecting straight lines with conspicuous drilled indentations at the ends of the non-intersecting lines. The reverse side of the pendant is plain. Straight lines terminating in indentations or punctations are part of the decorative repertoire of French Fork Incised pottery in the Lower Mississippi Valley. Philip Phillips observed that this feature is shared with Weeden Island ceramics from the Florida Gulf Coast. An additional occurrence of this feature on carved stone is the trachyte bird (owl?) head found decades ago in the vicinity of Mound G at Toltec Mounds. This object is featured in the December 2018, “Artifact of the Month” item authored by Arkansas Archeological Survey Toltec Station Archeologist Elizabeth Horton. 1982 Powell Canal: Baytown Period Occupation on Bayou Macon in Southeast Arkansas. Research Series No. 19. Arkansas Archeological Survey, Fayetteville. 1970 Archaeological Survey in the Lower Yazoo Basin, Mississippi, 1949–1955. Papers of the Peabody Museum of Archaeology and Ethnology 60. Cambridge, MA. A first principle of archeology is that the significance of artifacts depends upon documented information about the context of their discovery. At what site was the artifact found? Can we figure out the age of the artifact? Where was it found in relation to site features (houses, trash deposits, activity areas, etc.) and the distribution of other artifacts? Only with knowledge of those facts can we assess further information about the manufacture and use of artifacts, and their role in other spheres of activity such as social organization, trade and exchange, and religious practice. In this series, we feature select artifacts that are extraordinary both for the context of their discovery and for their unique qualities that contribute exceptionally important information about Arkansas culture and history. New artifacts will be added monthly. Find the list of artifacts here.